Official Description: Sloane, a stylish and driven publicist, is confronted by the ghost of her star client, Caitlin. She soon learns the error of her dating and workaholic ways. Christina Milian (Snow Globe) and Ashley Benson (Pretty Little Liars) star. Official Description: Trudie is an aspiring painter working as a restaurant waitress. With the pressure to please her parents building, she misses a job interview and gets dumped by her boyfriend just before Christmas, and she has a nervous breakdown. Stressed about going home for the holidays without a boyfriend, she kidnaps David Martin, a random customer at the restaurant in which she works and introduces him to her parents as her boyfriend, Nick. Trudie’s family is vacationing at a very isolated log cabin miles away from anyone else, so David is unable to escape, although he makes several attempts. He finally decides to play along until the police come, but he ultimately falls in love with Trudie and understands the family pressure that made her feel forced to kidnap him in the first place. 3. The Mistle-Tones This is the type of Christmas movie that I love. Great settings, music, cheesy romantic backdrop story and lots and lots of Christmas carols. I really liked Tia Mowry in the lead, she has a an amazing voice, even though it is a bit unsettling how good she looks, Sister Sister was over 15 years ago and she looks exactly the same as she did then. Tori Spelling is really annoying, however, you are supposed to hate her in the movie, so it doesn’t completely detract from the enjoyment of the movie. 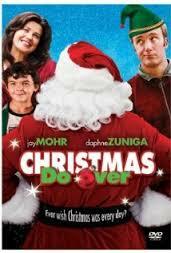 This is a strong contender for cracking my list of favorite made for TV Xmas movies. Official Description: Angela loves Christmas more than anything. However, her family does not share her love for the holiday at all. When she is about to break down because of her family, she receives a snowglobe in the mail. When she opens up the snowglobe, she is transported into the world inside, where Christmas is the heart and soul for everyone who lives there. She discovers she can return to her world by going down a small path in the small forest at the edge of the village, and can return whenever she winds up the snowglobe. After a long set of visits to the globe, she accidentally gets trapped inside. Official Description: Jennifer Walker, PR manager for an aging shopping mall, runs a contest to replace the traditional mall Santa Claus with a “hunky Santa”. But complications ensue when she falls in love with contest winner (and struggling restaurateur) David Morretti. Its cute, its just a little bit too crazy in concept to be higher. The cast is great though. I saw this one so long ago, and i think what i liked the most was the actress in the lead. Official Description: Gina and Seth became penpals when they were in the 6th grade. It is now 13 years later, and they still have been writing to each other but have not yet met. She is a journalist while he is a toy inventor. An opportunity arises when there is a toy convention in Boston. They decide to meet, but the only problem is that they have been exchanging pictures of their better-looking friends. When they actually do meet for the first time, it is not all fireworks. Can they reveal themselves to each other before it is too late? Official Description: Mary Class is a high powered businesswoman with her own marketing firm, as well as secretly being the daughter of Santa Claus. When her father falls ill near Christmas, she is forced to return to the North Pole to take his place. She employs her marketing and business management techniques to revitalise the workshop elves, and reconnects with her lost love Luke. Official Description: Nick Snowden, who is really Santa Claus, falls for Sandy Brooks who is a pretty zookeeper, who works at the zoo from which he must rescue Buddy, a young reindeer who has not yet learned to fly. He needs her help to get Buddy out, so he followed her to a boarding house that she is living at. Nick meets Lorna who is the landlord and owner of her boarding house. She thinks Nick is a tennant and got to know him and let him stay in the boarding house. Nick meets Hector, whose mother who is a postal worker and Hector figures out Nick is Santa Claus. Nick meets Sandy and falls for her. Sandy fell for him too and is unaware that he is Santa Claus. He helps Nick, get Buddy out of the zoo and back to the North Pole. Nick usually teleports himself in and out by mirror, the only way the mirror works is by using North Pole snow. Buck Seger who is a hunter who works at the zoo and has a crush on Sandy. He see’s Nick as a rival and research Buddy that he is from the north pole. He is planning on selling Buddy. 11. Christmas Do-Over A little bit foolish and predictable but it tries its best. Official Description: A man has to repeat Christmas Day over and over until he realizes how selfish he has become and changes his ways. Official Description: Santa’s in the midst of a late-life crisis—he’s tired of the responsibilities of the job and is ready to pass on the reins to his business-minded daughter Mary, who feels torn between the family business and running her own high-stakes firm in New York City, along with balancing a relationship with the love of her life, Luke. The situation gets increasingly dire when Teri, an ambitious new arrival to the North Pole, sows dissension at the workshop in an effort to take over Christmas. However, it is revealed Teri is an elf, bitter at Mary and was trying to take over Christmas. But Mary manages to stop her and take care of the yearly rounds around the world. 13. Christmas Caper Another 90s actress in a mildly entertaining movie, but its definitly not one one the ones I rewatch. Official Description: A Grinch-like thief retreats to her hometown in Connecticut after a con goes bad and gets stuck baby-sitting her niece and nephew until their parents can make it home for Christmas. She spends most of her time devising ways to even the score with Clive, her partner in crime, until the spirit of the holidays can help put her priorities back on track. Official Description: When Nick, Santa Claus, gets amnesia, it’s up to his newk wife, Sandy, and reindeer Buddy to save him and Christmas. But, when Buck (the man who had a crush on Sandy) tries to get revenge, things get tricky. 15. Christmas Bounty It’s just not good, might be one of the few christmas movies i didnt finish. Official Description: A former bounty hunter turns into an elementary schoolteacher. Determined to have a normal life and keep her bounty hunter past a secret, she reluctantly returns home for Christmas to help save the family business by catching the one bounty that got away. But when her fiancé follows her home for the holiday, she struggles to hide her wild family business and a bounty hunter ex-boyfriend she thought she’d left behind.